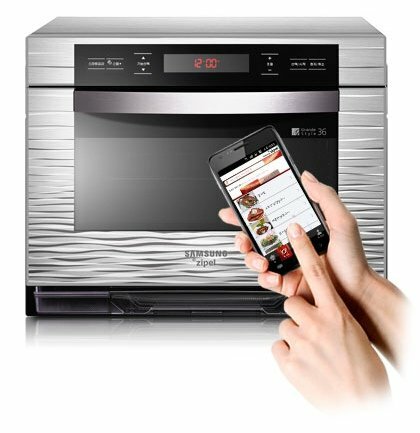 And it's over to Samsung for the latest in kitchen kit for lazy-arse cooks: a smartphone-controlled, app-operated oven. The Zipel MC368GAAW5A combi oven sports bactericidal ceramic plates that cook your grub with good old-fashioned heat rather than than vitamin-zapping microwaves - though if you like your food cooked nuclear hot and flavour free, it'll do that too. The good news for techheads: the oven comes with an app - Android, natch - pre-loaded with cooking parameters for 160 popular dishes. Simply tap your finger on the dish's picture and your phone will tell your Wi-Fi enabled Zipel what temperature to reach and how long to stay there. But wait, what's this? Yes, Delia ex machina, the Zipel will read out recipes as step by step instructions that will, claims Samsung, help "the novice cook like a housewife".